Instinct Raw Boost is the first ever grain-free kibble with freeze dried raw in the same bag. It's never been more convenient to nourish your dog with the nutrition of raw. 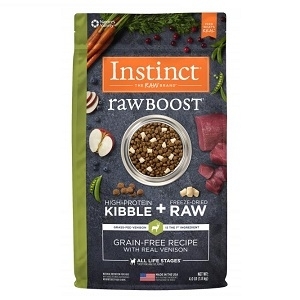 The grain-free kibble provides high protein nutrition along with freeze dried raw pieces to give your dog a bite-sized boost of healthy raw food. 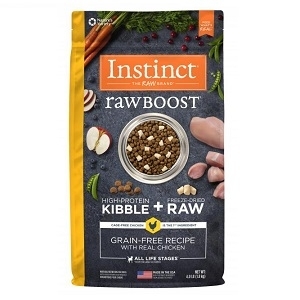 Nature's Variety Instinct Raw Boost Canine Kibble - Beef Meal Formula - 4.1 lbs. 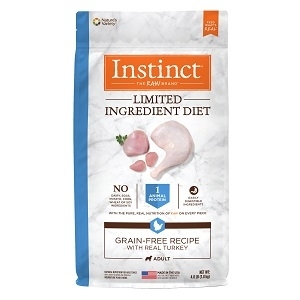 Nature's Variety Kibble Instinct Chicken 4.1lb. 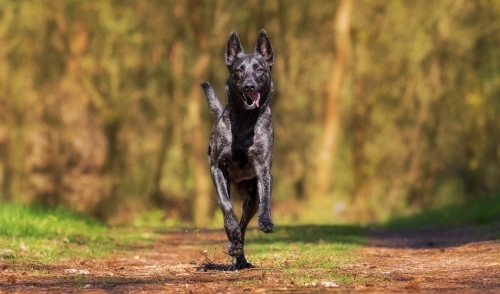 This grain-free dry diet is high in meat protein and low in carbohydrates, which is ideally suited to dogs' ancestry and biology as natural carvnivores. 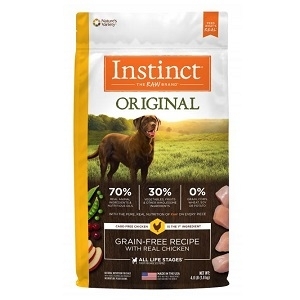 Instinct Limited Ingredient Canned foods for dogs are made with minimal ingredients to provide optimal nutrition. Each diet is grain-free and gluten-free, with one animal protein, one simple starch, vitamins and minerals, and just a few other wholesome, easily digestible ingredients. These pure and simple ingredients have been carefully chosen and thoughtfully balanced to give your dog a wholesome, healthy diet. 95% lamb, organs and bone. 5% vegetables, fruits, and other wholesome ingredients. 0% grain and gluten. Complete and balanced for all life stages and all breeds. Never cooked, mirrors a dog's ideal ancestral diet. All natural, nothing artificial. Made with whole foods for optimal nutrient absorption. 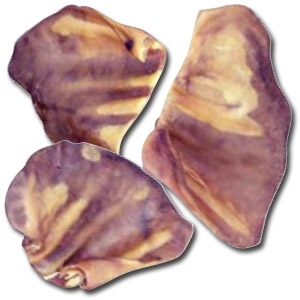 Contains natural enzymes for digestive health. 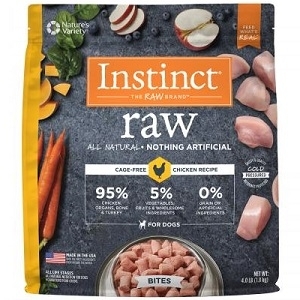 Safe raw food, quality assured. 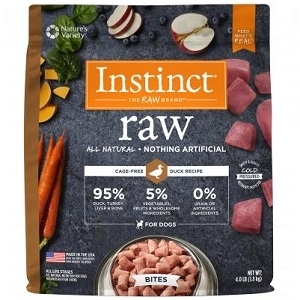 Instinct Raw Bites provide the nutrition of raw with the speed and convenience of kibble! 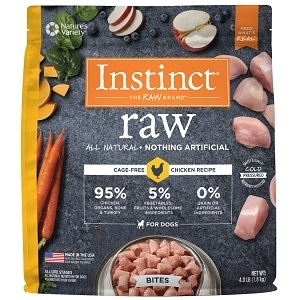 This form of raw thaws within minutes for a fast, bite-sized meal for your dog or cat. 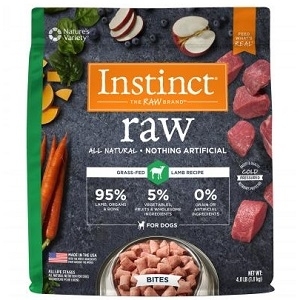 Instinct Raw Frozen Diets are formulated like the ancestral diet with 95% meat, organs, and raw ground bone, and with wholesome fruits and vegetables. Dogs and cats are meat eaters by nature. A diet consisting primarily of raw meat, organ meats, bone, and fat reflects what your pet would eat in its natural habitat. Since dogs and cats are carnivores by nature, they thrive on a food rich in nutritious meat. NaInstinct Raw Boost is the first ever grain-free kibble with freeze dried raw in the same bag. 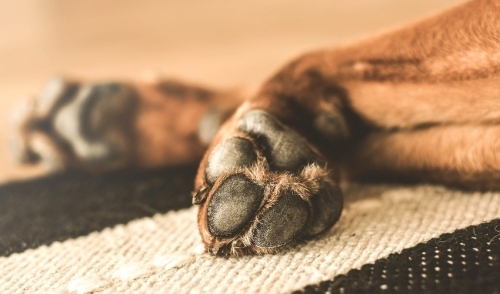 It's never been more convenient to nourish your dog with the nutrition of raw. 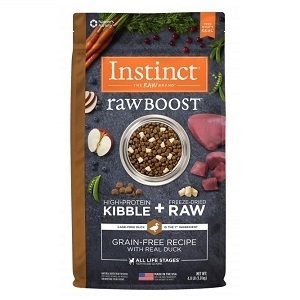 The grain-free kibble provides high protein nutrition along with freeze dried raw pieces to give your dog a bite-sized boost of healthy raw food. 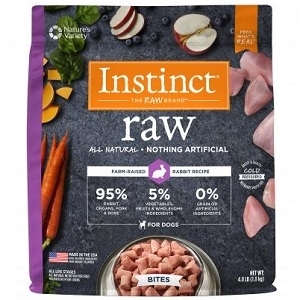 Nature's Variety Canine Instinct Beef Meal/Lamb Meal Diet 25.3 lb. 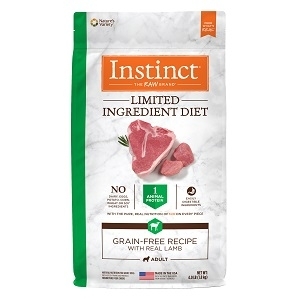 Nature's Variety Instinct Beef Meal/Lamb Meal Diet 13.2 lb.